Does anyone know the origin of the music or the composer? Looks a bit "second hand". The member Electro does not seem to be the german one. I remember a lot of JJ cracks for UCF. 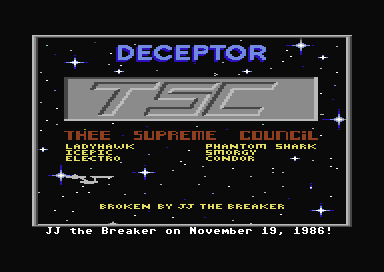 Classic intro with bottom scroll, ST Enterprise sprite and music set against a koala paint screen background. Some of the members of this group were also in UCF. Funny thing.... JJ did all the cracks for both groups!? !